I think we need an avant-gardeÂ to deepenÂ integration. We are unable to move togetherÂ because of some misperceptions by our British friends. We need an avant-garde, such as the Eurogroup, to deal with challenges such as the developments in Georgia and the current financial crisis. Otherwise we will be sitting, doing nothing, waiting for the Irish miracle. Oh, those reticent British, holding everything back. The EU has struggled to have a united position regarding Georgia at least as much due to Germany’s close relationship with Russia and Polish fear of Russia as it has as a result of poor foreign policy mechanisms due to British administrative reticence. On questions of economic governance Fischer might have a point – the UK does not want economic governance for the EU conducted at EU level. But Britain is not in the Euro, and even the Eurogroup that Fischer cites has been unwilling to be radical in the face of an economic crisis. Hell, Brown even seemed to be the one with some ideas in Paris this weekend. So what is the root of the problem? Essentially there are no politicians in Europe setting out a brave, ambitious and forward looking approach for the EU. Member States are all rather reticent, preferring a weak and pliant Commission President (Barroso) and a technocrat in charge of Foreign Policy (Solana). Fischer would be better to devote himself to putting some determined politicians in top positions in the EU (himself for example?) rather than grumnbling about the UK. We just had a first Eurozone summit yesterday; perhaps even with some practical results. Joschka Fischer’s avant-garde is far from unproblematic institutionally, since it would mean one more group of intergovernmental cooperation, with all that entails for democracy, legitimacy and accountability. Would the new core group be mired in unanimity? Real new powers for the European Union, or a core group, would have to be founded on democratic rule and legitimacy. How many EU member states are ready for that, despite populist fringe parties on the rise and the popularity of the union declining? Despite these shortcomings, Fischer’s analysis is correct insofar as he sees the need for stronger European action with regard to global and European problems. Fischer is actually a man I would like to see in a top EU job myself, such as Commission President. 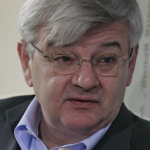 Joschka Fischer has already fully used his reservoir of idealism during his early years. The is not much left for him become an avant-gardist himself.